Dog Training Basics - Dog Training 101 - Setting your dog up to succeed. OK, you’ve researching the right breed for your family and spent hours on petfinder.com and visiting shelters. You finally found the perfect dog! Fast forward several weeks and you and your new best friend are spending lots of time bonding. It’s going very well. So What’s Next? It’s time to start working on some dog training basics! Are you ready to start teaching your dog some basic behaviors? Maybe even a few tricks? OK, but first you need to know a few things. No matter what the dog’s age, you need to realize that training MUST be fun for you and your dog. If it’s not, your dog will shut down and will want nothing to do with it. So how do you make it fun? How do you get your dog interested and keep his interest in training? IT’S EASY. You make training into a game! Praise him in a happy voice and reward him every time he does something you like. Reward him with one of his favorite toys or a treat. If he sees that you are happy he’ll go out of his way to make you stay that way. 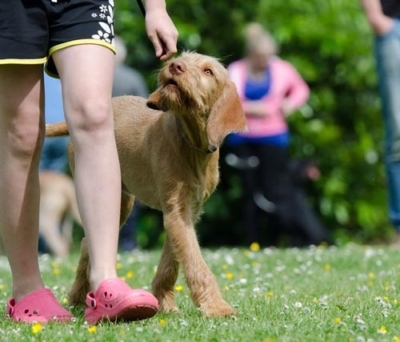 Here are some other great tips to keep training fun and keep you dog interested. Keep your training sessions short. Young dogs have a very short attention span. Even adult dogs get bored quickly. Training sessions should be kept to around 5 minutes. For puppies, keep it to around 2 minutes. To keep the training fresh in your dog’s mind use multiple sessions daily. Keep It Friendly! Always speak in a happy tone of voice when giving commands and offering praise. Stay positive! Never show frustration, anger or disappointment when your dog doesn’t get the behavior right away. Instead, try to figure out a better way to communicate what you want your dog to do. Work on only one new command at a time. Trying to teach more than one new command at a time can confuse your dog. 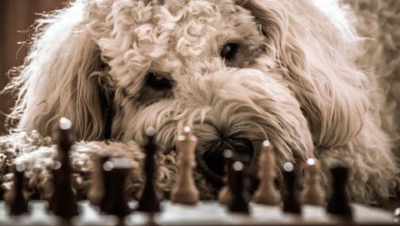 Set your dog up to succeed. If your dog is struggling with a new command, slow down. Switch away to one that he already knows so that he doesn’t become frustrated. Then go back to the new one after the success of the known command. Set a goal for each training session. Once you have reached that goal, end the session. Even if it means that the session is only one minute long! Follow each training session with a 5 -10 minute play time with it’s favorite toy or activity. When your dog knows that training ends with playtime, he will look forward to it. He will be more likely to do the training correctly so he can get to the playtime faster. Always start training new behaviors in a quiet setting with no distractions. This makes it easier for your dog to concentrate. After they are proficient with the behavior then you can use noisy places and distractions to proof training. Only reward a behavior when it is done 100% correctly. There is no such thing as “Close Enough” in dog training. It’s either Right, or it’s Wrong. Use a High Value reward or treat. Your dog is more likely to work for a chance to play with it’s favorite toy, a piece of fresh cooked chicken or meaty smelling treat than it will it’s regular dry dog treat. This is another reason you must go thru the “bonding process” before training begins. You must know what his likes and dislikes are. End every training session on a positive note. This means that the dog does a trick or behavior correctly and gets rewarded for it. If you are training a new trick or behavior, end the session with one he already knows. This will help build your dog’s confidence and self esteem. Training is a great way to continue building the bond between you and your dog. It keeps the lines of communication open, and keeps dog and owner working toward a common goal.